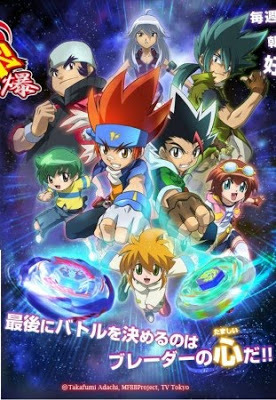 Beyblade: Metal Masters is the second season of Beyblade: Metal Fusion and the the fifth season of the Beyblade anime. Gingka and his friends meet a new Blader named Masamune Kadoya. Masamune is a new Blader who joins Gingka’s group and will stop at nothing to defeat him. The WBBA sponsors the new “Beyblade World Championships“, a world tournament where four representatives from each country around the world gather and battle to become the world champions. When Gingka, Masamune, Tsubasa and Yu are chosen as the representatives of Japan, they won’t hold anything back to become the world champions!